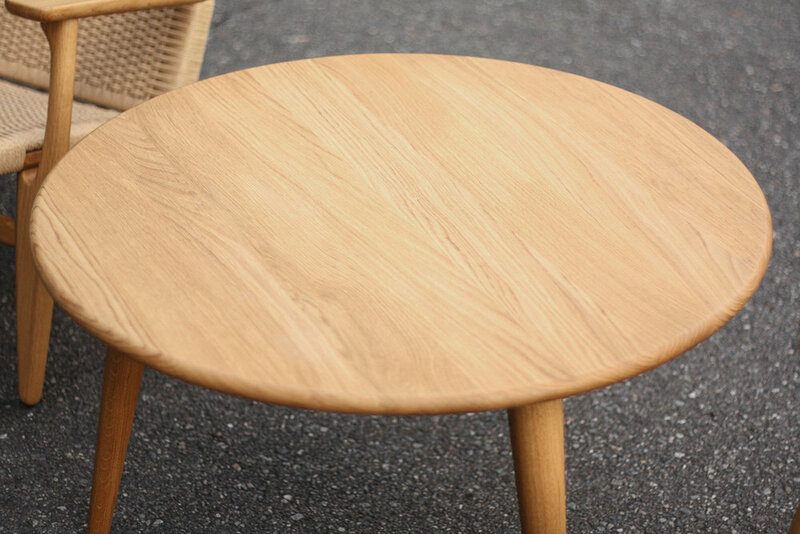 Hans Wegner's philosophy of never designing furniture with a backside is clearly visible in the construction of his round CH008 Coffee Table. Retail price for this piece is $1950 plus tax and shipping. This three-legged, table is as beautiful as it is simple. No frills. No fluff. Just great design. The table is made from solid oiled oak. No veneer anywhere which means you'll never have to worry about chips or cracking. This also means the coffee table could be refinished in the future without fear of sanding through or ruining the table. Angled tapered legs can be removed in a jiff to allow easy transport. Retains its "Carl Hansen and Son" foil label proving it is the real deal and not a replica.